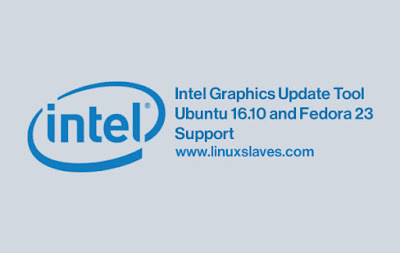 New Intel Graphics Driver For Linux Has Been Released - The Intel Graphics Update Tool formerly known as the Intel Graphics Installer for Linux 2.0.3 finally updated with Ubuntu 16.10 and Fedora 24 supported. This tool aims to make the latest Intel Graphics Stack available before it gets officially released by Linux* OS vendors. Specifically, it benefits those Linux* users of both Ubuntu* and Fedora* distributions who want to update their graphics subsystems for Intel platforms. This update tool offers the latest Intel 2016Q3 graphics stack and targeted specifically at both the Ubuntu 16.10 Yakkety Yak and Fedora 24. Choose which one matches with your OS ( Ubuntu 16.10 32bit / 64bit or Fedora 24 32bit / 64bit ). Earlier revisions for those Linux distributions are now deprecated and are no longer being supported by the update tool. Please upgrade to a more recent version of your OS distribution if you want to take advantage of this release. So that's all I can write about the latest Intel Graphics Update Tool For Linux. Hope you've enjoyed reading this post. Thanks for visiting us!